"41MR12, Burial II, 49" by Timothy K. Perttula and Robert Z. Selden Jr. VESSEL FORM: Carinated bowl with an everted rim and a rounded lip. The vessel also has eight dramatically sweeping rim peaks. DECORATION: There are two different decorative elements on the vessel rim. Immediately under the lip and the rim peaks are a series of closely-spaced vertically incised lines. The remainder of the rim has an engraved continuous scroll motif repeated four times around the rim, with a central circle element. The combination of vertical incising and an engraved motif on the rim is stylistically diagnostic of the recently defined var. Walkers Creek of the Ripley Engraved type (Perttula, ed. 2005). 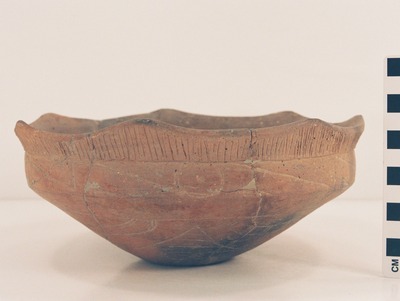 This vessel from the Ben McKinney site stands apart from other Ripley Engraved vessels because it also has elaborate engraved designs covering the vessel body and base. The body and base engraved decorations consist of a central rectangular element surrounding a circular element (defined by two lines); the corners of the rectangle are hatched, and two of the corners also have smaller engraved triangles that intersect of the hatched lines. The central rectangular and circular motif is juxtaposed with four curvilinear zones filled with sets of closely-spaced vertical hatched lines. Ripley Engraved, var. Walkers Creek vessel, MR12-49: a, side view; b, bottom view.